April’s Exeter Business Network event – sure to be a masterpiece! A masterpiece in terms of conversations and connections! 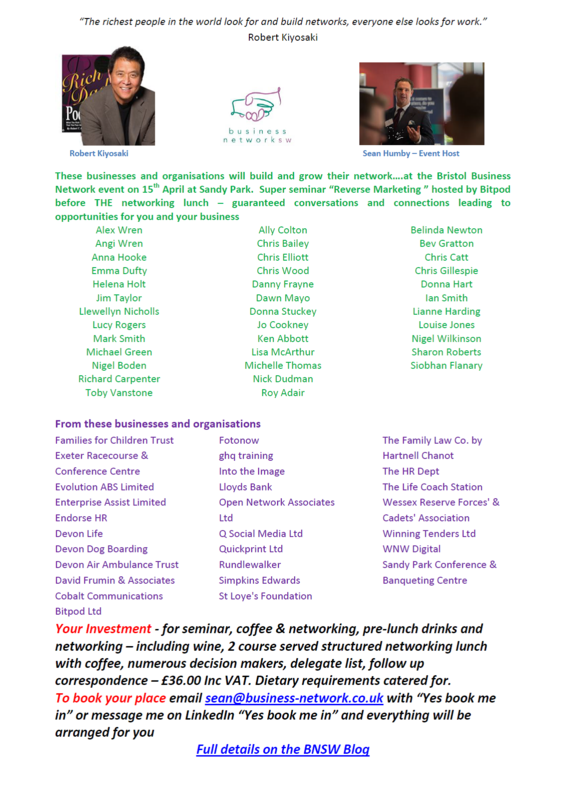 Business Network SW has been creating the ideal environment for this creativity since 1993 and the event on April 15th promises to be no exception! In brief – the event where you can be creative and generate opportunities…. Cost of event for you as a visitor is £36.00 (Inc. VAT) covering seminar, coffee, 2 course served lunch with drinks – wine available, event programme, delegate list, dietary requirements are catered for. Business Network SW has been hosting monthly lunch time networking events in Exeter since 1993. Developing a reputation and pedigree for benefiting businesses in growing their network and building their business through great conversations in a structured and relaxed format……. The seminar before THE networking lunch – sure to spark your creative side! Alex Wren from Bitpod will share his ideas and experiences with Reverse Marketing. If you don’t like cold calling, sending promotional mailers or spending money on advertising, then this could be just what you need to market your business in 2015! Reverse Marketing focuses on the customer journey, Bitpod are big fans of this technique and can claim numerous successes, some with brands that you might of heard of (such as Baxters, NHS, Pasta King & Calendar Club) and some other equally excellent local businesses. In this seminar, Alex will share his toolbox of techniques to help your potential customers discover the benefits of your product or service. Naturally video marketing methods will be covered, however this seminar is about the overall strategy and how to make everything work together from social media to your CRM to your website and more. Bitpod promise you will walk away with some great new ideas to try and your very own Reverse Marketing action plan. What follows will only offer more creative opportunities for you and your business…. The event finishes at 2pm – all you need to do is follow up!